In general, the development of immunity is a complex process. With Eimeria, the process is further complicated by the parasite’s multifaceted lifecycle, with each stage of the lifecycle presenting a different set of antigens to the immune system for recognition and response. Although both cellular and humoral immune responses are stimulated during coccidiosis, they differ in the extent to which they respond to the infection. Since the majority of the Eimeria lifecycle occurs intracellularly, the most effective immune response is of a cellular nature, and not a humoral one. The development of immunity is also influenced by the level of parasite infection. In a heavy infection, the immune system reacts with a short-term humoral immune response. 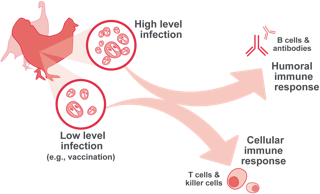 In a low level infection, such is produced by vaccination, the immune system reacts with a cellular immune response that offers a more complete, longer term immunity against the parasite. The relative short duration of this type of immunity requires a constant exposure to a low level circulating Eimeria to sustain a protective level of immunity.